You’re a gourmet cook who likes to spice your dishes with fresh herbs. Yet you live in a climate that forbids growing anything beyond the first autumn frost. Instead of watching your basil plants wither on your windowsill, you’ll soon have another option: A smart micro-greenhouse that automatically sets the ideal conditions for cultivating organic herbs right in your own kitchen. Inside the chamber are six terra cotta pods, packed with nutrient-rich soil, that can be replaced every month to grow different herbs in every season. The wood-framed and acrylic-covered countertop greenhouse was developed by a team of students from diverse majors at Cornell — mechanical and aerospace engineering, computer science, plant science, and hotel administration. For the past two and a half years, they have built dozens of prototypes while working with faculty members and entrepreneurs across campus to launch their startup, Íko Systems, which will begin marketing the device this spring. The micro-greenhouse was the brainchild of Michael Eaton ’18, a mechanical engineering major who grew up in Botswana, where his extended family owned game farms. After arriving at Cornell and moving off campus, Eaton wanted to bring some greenery into his apartment so he tried growing potted herbs. When he realized that he could not keep them alive during the winter, he bought a few plug-and-play gardens. Michael Eaton ’18, founder and former president of Íko Systems. Photo courtesy of Íko Systems. Beyond improving the esthetics, Eaton believed he could design a tabletop greenhouse that would use a climate-controlled environment to allow herbs to grow year-round. In the fall of 2016, he mentioned the idea to two friends — Alegria and Liad Hare ’18, a hotel administration major — and they began working together to build a self-sustainable product that would leverage technology to enable consistent and reliable plant growth. The students embarked on a two-year journey through Cornell’s entrepreneurial ecosystem, which provided them with a steady supply of mentors, technical resources, funding, and courses to help them develop their product and move it toward commercialization. They built a website and named the greenhouse the Okavango, the name of a river delta in Botswana. 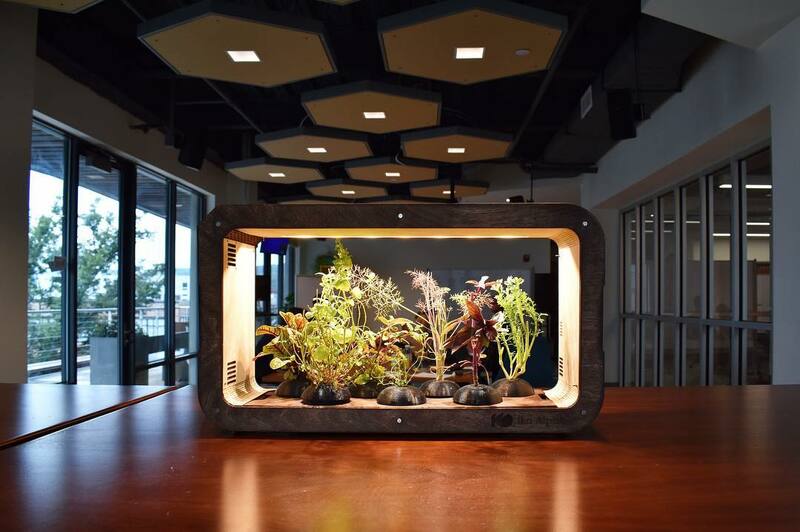 While most deltas in southern Africa open into the ocean, the Okavango flows into the Kalahari Desert, which Eaton suggested was an apt metaphor for the micro-greenhouse. “It’s just a very appropriate name – you’re growing greenery where it shouldn’t be,” he says. The team’s first break came in 2016, when Eaton and Alegria each won $15,000 grants through Cornell Engineering’s Kessler Fellows Program, a yearlong immersion in entrepreneurship that includes courses, personal exploration and a summer startup experience. In the spring of 2017, they took a course on business plan creation in the Hotel School. The following summer, they were admitted into the 11-week Hardware Accelerator program at Rev: Ithaca Startup Works, a business incubator in downtown Ithaca, which is sponsored by Cornell, Ithaca College and Tompkins Cortland Community College. Every day from 10 a.m. until after 1 a.m., the team converged in Rev’s offices on State Street, where they refined their prototype using modeling software, surveyed potential customers and created a pitch for their product. 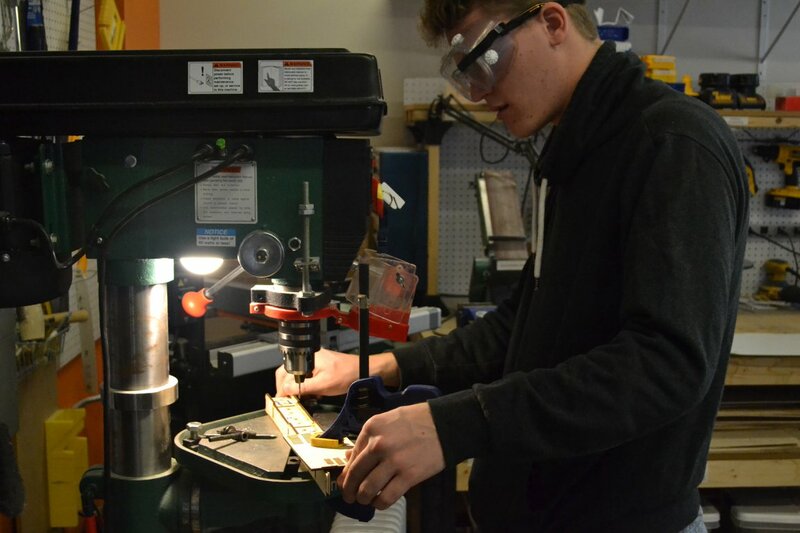 Ben Sword ’18 uses a drill press at Rev: Ithaca Startup Works. Photo courtesy of Íko Systems. By now, the startup had attracted three new members: Ben Sword ’18, a plant science major; Sivan Sud ’18, a mechanical engineering major; and Jai Singh ’18, a computer science major. Within a few months, Natha Singasaneh, a mechanical engineering graduate from Carnegie Mellon University, joined the project after reading about it on Twitter. “They were able to build a diverse team, both in culture and knowledge and experience,” says Felix Litvinsky, managing director of Blackstone LaunchPad, an entrepreneurship program at Cornell, who mentored the team. “It wasn’t just mechanical engineering or computer science. They were able to utilize the talent from all areas of Cornell. After completing the summer program, the team was accepted into another competitive entrepreneurship program at Cornell — eLab, which provides a year of mentorship, training, business funding, and a co-working space on College Avenue designed for student startups. Íko Systems was one of 12 teams selected into eLab from more than 50 that applied to join during the 2017-18 academic year. “They are probably in some ways the poster child for getting every bit of help out of Cornell they could get — in a very good way,” said Ken Rother, the director of Rev and one of four entrepreneurs who mentored the Íko team in the eLab program. Beyond Rev and eLab, the Íko team also took the entrepreneurship practicum at Cornell Engineering, offered for the first time in spring 2018. The course allows students to work on designing a product in Cornell’s labs while earning course credit. One of the first business challenges the team faced was identifying a market for the product. 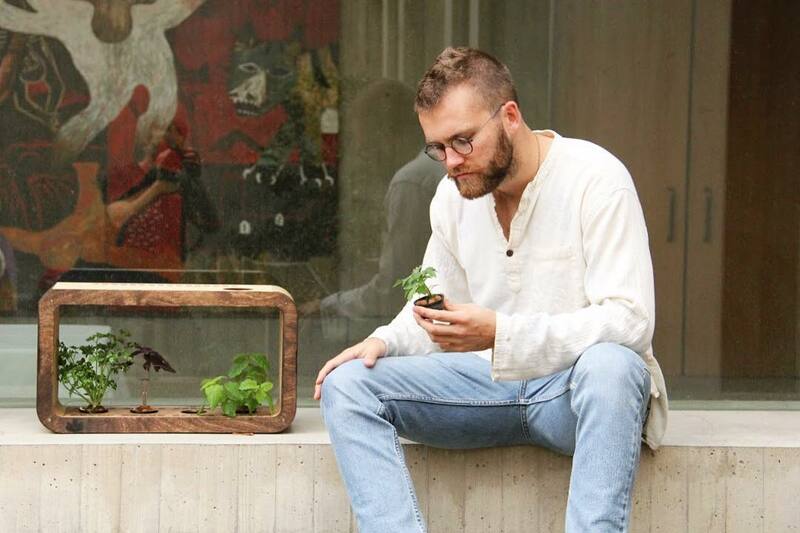 After spending a year interviewing students and friends in other cities, their research honed in on the ideal customer: a sustainably minded, urban foodie who struggles to source culinary herbs year-round. Another market segment was millennials who would be attracted to the product’s app that allows them to track their plants’ growth, buy replacement pods, and get botany tips and recipes from other customers. Another obstacle was designing the controlled environment where the plants could grow year-round. The team consulted with Neil Mattson, a leading expert in controlled environmental agriculture and an associate professor in Cornell’s School of Integrative Plant Science. Mattson introduced the team to Sword, one of his students, who developed the 5-inch-long terra cotta pods that allow water to pass through while retaining the nutrients and organic peat moss. To regulate the climate inside the greenhouse, the team created a series of fans, LEDs, and a temperature and humidity sensor. They also developed a climate control algorithm that takes real weather data from anywhere in the world — the Tuscan landscape, for example, if you’re growing basil — and simulates that climate in the system. Since most of the team members have graduated, the startup plans to leave Ithaca and move to either New York or Boston, closer to the customer base it hopes to attract. The team has also shifted as it moves closer to launching the product — Eaton, for example, left the team last fall to pursue other ventures. Before leaving Ithaca, the startup received a boost when it won $10,000 in the Cornell Engineering Innovation Award Competition and a $50,000 grant from FuzeHub, a not-for-profit organization that assists small- to medium-sized manufacturing companies in New York state. The team will use the money to build 30 beta units that will be tested in potential customers’ homes and hire a consulting firm to help the startup begin manufacturing. At 22 inches wide and 12 inches high, the Okavango will initially sell at a discount rate of $200 through a Kickstarter campaign for customers to buy a unit through the website in advance of full-scale production. Once it hits the market, the greenhouse will sell for $300, and the pods can be replaced for $12 each month, Alegria says. What would it take to start your own business at Cornell? Find out with the Entrepreneurship Roadmap website.